Montana's Bull Mountain Ranch is a sustainable mountain recreation ranch and horse property, with alternative energy opportunity, that is located in the Bull Mountains of south central MT. With a total of three residential country homes, one which is currently being utilized as an income property and four individual heated cabins, this sustainable recreation property with alternative energy is set up for business retreats, hunters, multifamily or guests. This sustainable ranch property in Big Sky country borders 640+/- acres of State of Montana lands allowing public access for recreation, hunting and wildlife viewing. Mule deer, wild turkeys, upland game birds and song birds, along with occasional migrating elk and black bear, make this property their home. Located in Musselshell county, this sustainable recreation ranch & horse property is just east of the small community of Lavina Montana and within 60 miles of the Billings Logan International Airport. Billings is Montana's largest city with all the amenities and conveniences of a large population center. 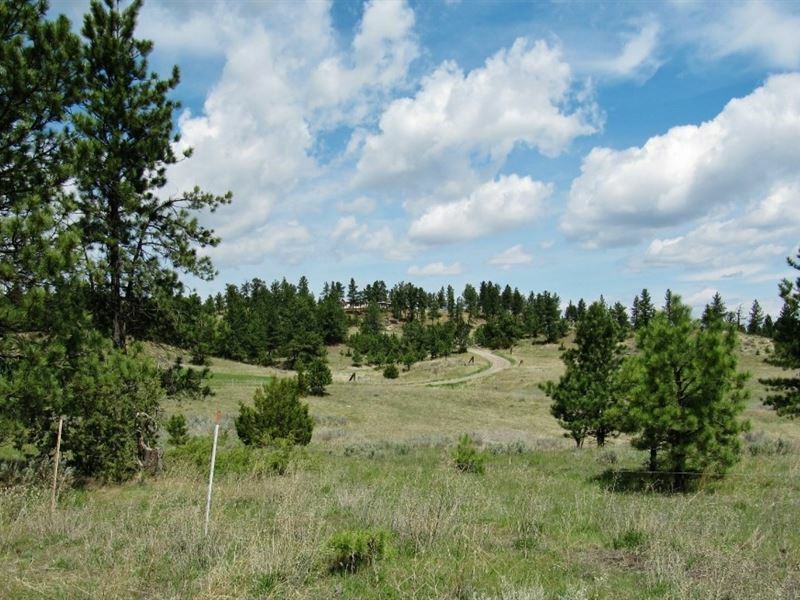 With 213+/- deeded acres, the Bull Mountain Ranch in Lavina Montana offers sustainable living along with unlimited opportunity for a wide variety of interests and visions. With three country homes, four heated cabins and two updated manufactured homes, this ranch is a great multifamily recreation mountain get-away. The single family dwellings are all 3-5 bedrooms and the cabins vary in sizes from one to three beds. With 16 total bedrooms this ranch can sleep up to 20+ individuals. All offer quiet settings in the timbered fringes of the open ridge. Gazebos with soaking tubs and two Labyrinth gardens are available to offer relaxation to you and your many quests. The ranch sets primarily on an open ridge with pine and juniper forests flanking the open grazing land which is fenced into several small paddocks, each with its own water hydrant. The water system on the property is served by four wells with pressure systems. A fenced apple orchard and a large fenced garden area, with installed water hydrant systems, round out the infra-structure needed for sustainable living. The grazing land is a mixture of native and improved pasture species which extends the useful season in both the spring and fall. All fences, perimeter and the cross fences forming the paddocks, are in very good condition. The ranch would easily accommodate up to 70 Aum's. Sustainable living, alternative livestock, purebred sheep or cattle and a horse operation are all very viable options for this property. Improvements on the Bull Mountain Ranch include a 40' x 72' heated & insulated metal shop building with 3 overhead doors and 2 walk-through doors, kitchen area including plumbed sink, cabinets and counters. This building has been used as a main Hall for quests to gather and share meals in. It would be easily converted to a ranch shop/garage, RV and/or equipment storage. Ranch and farm equipment can be easily stored in the 4 bay open front wooden shed and the pole barn with metal sides and open front, Generous room for livestock and pets with a tack barn housing numerous livestock pens, a loafing shed, numerous animal shelters, pens and corrals, chicken coop with internal roosts, nesting areas & electricity. Additional storage facilities include 3 metal grain storage bins, a 10' x 24' storage shed, a screened shed with water lines, pump house and the garden shed. The water system with 4 wells and a dozen hydrants, 3 septic systems and underground electrical services are all in place. Additionally, the main house and cabins have an alternative energy source with a four-panel solar system including solar inverters batteries are not included and a back-up generator. Propane is the main fuel source with 5 above ground leased tanks and 1 underground owned tank. Heat is supplemented by wood burning stoves and furnaces in some of the dwellings/cabins. Truly, this is a unique property where you can continually relax and refresh while creating the life style you have envisioned, Picture yourself on the deck with a morning cup of your favorite coffee or tea, relaxing under the big blue sky of Montana. You look to the southeast and you see nothing but nature and miles and miles of rolling Montana prairie grasslands. The whisper of the wind in the Ponderosa pine and Rocky Mountain juniper is the only sound. Or, the same deck in the evening with the sun settling behind the trees while mule deer and wild turkeys appear and begin feeding. You are at home on the western edge of the unique Bull Mountains in south central Montana. On this beautiful sustainable ranch and recreational property, you will be limited only by your imagination. Click here to email the Agent and get more information or schedule a viewing of this ranch.